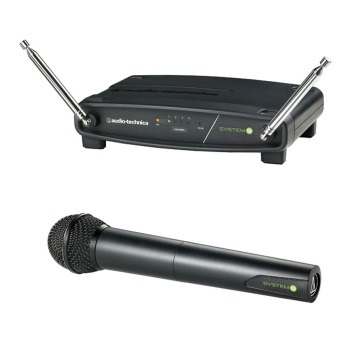 The Audio-Technica System 9 ATW-902 wireless handheld microphone system is a four-channel frequency-agile wireless system designed to provide rock-solid performance along with easy setup and clear, natural sound quality. Includes ATW-R900 receiver and ATW-T902 handheld dynamic unidirectional microphone/transmitter. Includes AT8456a Quiet-Flex(TM) stand clamp.